This time I asked my wife to help me shoot a short video on baiting honeybees with corn syrup and using the left hand brace technique to control the movement in the scene. Something that I didn't mention in the video is that I take a lot of images to get the one shot that I'm looking for -just too many variables to deal with. The depth is thin, moving the area of acceptable focus just a fraction of a millimeter can change the composition, and bees are constantly moving their antennas. Frequently I'll nail every aspect of a shot only to have to deleted it because the bee moved it's antenna right as I was pressing the shutter and it's obscuring an important feature like the eye or the proboscis. 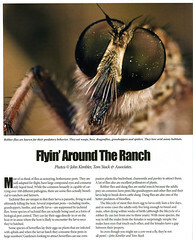 Range Magazine published four of my fly photos along with an article that I co-wrote with Tom Stack (he manages my portfolio). There are also a couple of text books that might have my images in them in the near future, but nothing that I can mention specifically yet. My mother in law planted pumpkins again this year and fortunately I managed to get some compositions out of my head from shooting honeybees in these flowers a few years ago. In 2007 I was shooting them when they stopped to clean themselves -that pumpkin pollen irritates them pretty bad! But since they were just sitting on a leaf without much to keep them busy they wouldn't let me get very close, and I was limited by the angles that I could shoot them. The trick was to put down some corn syrup on a flower petal and wait for the girls to find it and start feeding. I placed my left index finger directly under the bee (with the petal between us) and put my thumb on top. Then I curled the petal around my index finger to get it out of the way so I could shoot at a low angle and not get the petal in the foreground (it would have been out of focus and distracting). All that was left was to place the lens on my left hand to keep it steady, and since I was holding onto the flower I had a lot of control over the composition. I wanted the line from the eye to the end of the proboscus in focus, so I just went looking for a "magic" angle" that would make the most of the curve. It sounds complicated, but with practice it's actually pretty easy to do. This frame was taken close to 3x at F13. I was adjusting the mag based on the framing that I wanted so I wasn't at even mag markers on the MPE-65mm. I also took this shot with the camera held horizontally, but I framed it knowing that I'd turn the photo 90 degrees in post -easier than trying to hold the rig vertically.